1) Calendar publish/subscribe: Erin and I are already sharing our calendars and have access to each other’s schedule. 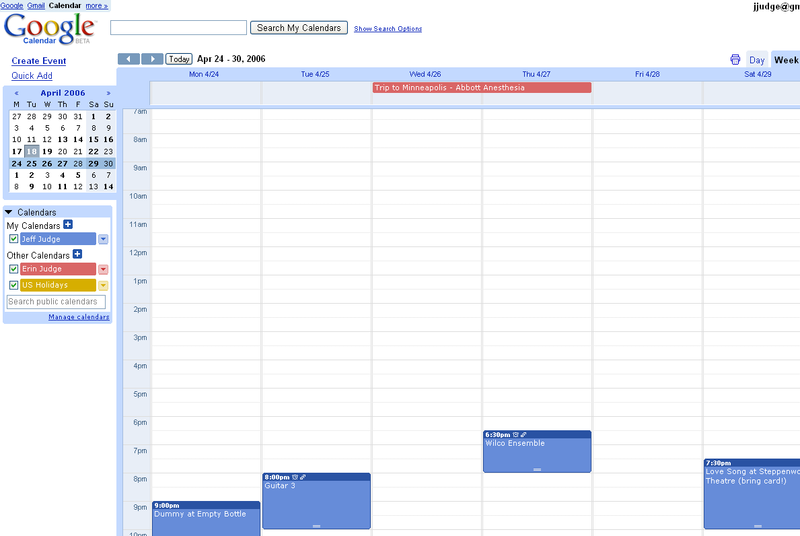 You can publish your calendar privately or publicly. You can subscribe to public calendars like US holidays, cubs schedule, etc 2) Meeting invitations: part Evite, part Outlook/Notes - you can create an event and invite participants. You can respond yes/no/maybe with comments, etc. Invitation comes in the form of an email or sms message. 3) Usability: like Gmail, it’s simple to use…it’s even fun. You can also import calendars (.ical or .csv) from popular calendaring software like Microsoft Outlook, Apple Address Book, Palm, etc. I’m sure that Microsoft will do something interesting with calendars one day…but Google made a gigantic leap ahead of them in functionality, usability, accessibility and cost (free). Looking forward to seeing google clean up their syndication of calendars (published as xml now…would like to see RSS feeds) and integration with mobile phones.